Young and successful, who would give that up? One young man who falls in love, gets hitched, and throws it all out the window to take his newlywed bride on the most rewarding journey of their lives around this little blue ball we call Earth. This travel journal is a vicarious backpacker's dream that provides readers with the inspiration to get out of the daily grind and get moving. Journal entries that read like poetry from the soul are accompanied by photography and original artwork. Packaged and designed in full color, this book includs over 170 photos. The author's national fan base, an estimated readership of over a million, responds that this book provides the motivation needed to get out and experience the glory of the world in all its grandeur and beauty. 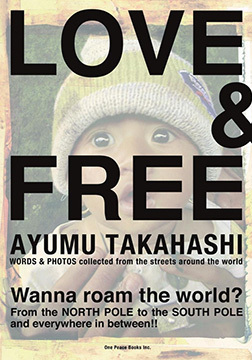 A bilingual book, LOVE&FREE : words collected from the streets around the world, written by the charismatic Ayumu Takahashi is one his best sellers, selling over 215,000 copies in Japan. The accumulated total of sales for all of his literary works tops over 1,100,000 copies. In all major Japanese bookstore chains, you will commonly find Ayumu Takahashi sections with his published works displayed in highly visible areas. Ayumu Takahashi has become one of Japan's most popular authors and his initial shipping is usually over 50,000 for new titles. This book has become a breakthrough seller and 4000 copies are being shipped every month. Ayumu Takahashi, at the age of twenty, inspired by the movie Cocktail, dropped out of college and together with friends opened, Rockwells, an American style bar. In two years he expanded his one bar to four. At twenty-three, in order to publish his autobiography, again together with friends, he established his own publishing company, Sanctuary Publishing, Inc. Here he produced a number of hit books and his autobiography, Everyday is an Adventure, became a best seller. He was married at twenty-six and just three days after his wedding, relinquished the title of president to set out on a journey around the world with his new bride. Approximately two years later, after having roamed thirty some countries, he returned home. In December 2000, he and his wife settled in Okinawa. Presently, he is the president of four of his own companies: A-works, Inc., a book and magazine publishing and producing factory, Play Earth, Inc., an international cafe and guesthouse developer, Island Project, Inc., a self sustaining Okinawa island village producer, and One Peace Books, an international seller of his works. As a father of two he still continues to take adventures around the world.